I made a treat for a work friend whose last day at our tv station was Friday. Brad is moving on to further his education, which I applaud! However, since he’s been someone I’ve enjoyed working with as he cheerfully ran camera for my cooking segments, helped me post stories to our website, and other various things he has done so skillfully, I’ll miss his presence at work! Brad told me his favorite dessert in the world in pumpkin pie. 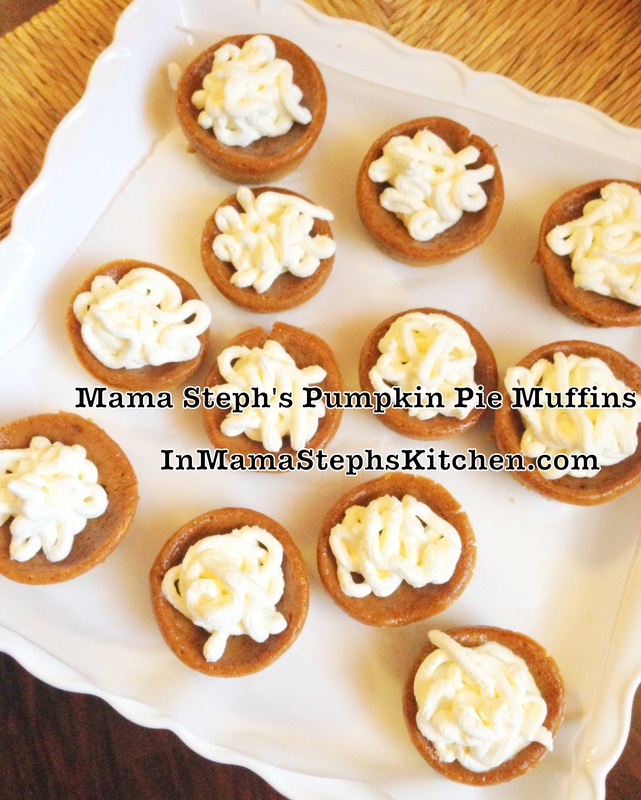 I thought I’d put a spin on pumpkin pie by making pumpkin pie muffins with homemade whipped cream; that way, they were portable and easy to eat at work. There’s no crust to fool with, but they’re firm enough not to require it. They turned out perfectly! Well, unfortunately, on the way to work that morning, I got a phone call from my son saying he and his brother had just been in an accident! That is always a moment of terror for a parent, isn’t it? Thankfully, they’re both ok and no one else was involved. However, I picked them up, had the truck towed, and took my boys home to doctor their minor injuries and to feed them. 1. Spray muffin tins with cooking spray, or use a silicone muffin tin. Do not use paper liners, as they will stick. Preheat oven to 350 degrees Fahrenheit. 2. In a medium mixing bowl, combine pumpkin, both sugars, eggs, milk and vanilla. Whisk until smooth. 3. In a separate bowl, combine flour with spices, baking soda, baking powder and salt. Whisk to distribute spices evenly in the flour. 4. Add dry ingredients to the wet ingredients using a hand mixer or by just stirring vigorously until well-combined and the mixture lightens in color slightly. 5. Scoop into regular-sized muffin tins using 1/3 cup measure. Bake for 20 minutes. Cool in pan for 2o minutes, then remove from pan and chill in refrigerator for about one-half hour. I am interested in the Pumpkin Pie Muffins. However, the oven temp. Is missing from the recipe. Help. Please. I’m so glad you noticed that and asked! The temp is 350 degrees F. I’ll go fix it right now! Think I sent your yummiest recipe back to you. I need a keeper. They sound really good but I might add raisins and nuts. Of course everyone doesn’t like raisins and nuts. Hmm…I can almost smell the warm aroma of pumpkin spice:) And I agree with the pecans for a delightful crunch!